This year's bake sale went well! Over $5,000 was raised to help fight kids cancer. My mom and I had a lot of fun making and packaging cookies for this sale and are already looking forward to helping out next year. If you want to help next year, the event will be held on the second Saturday in December so, SAVE THE DATE! Divide the dough into separate bowls, one for each color you will make. If you aren't coloring the dough, skip ahead to putting the dough in the cookie maker. Add a couple of drops of food coloring to each bowl and combine well. Cover dough with wax paper and chill in the fridge until firm again. Put dough in cookie maker and punch out onto baking sheets. 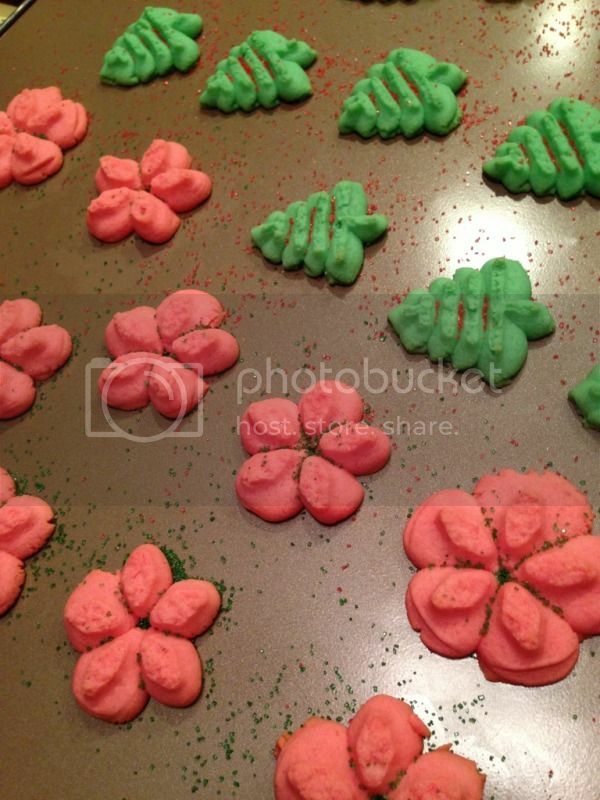 If you are putting sprinkles on the cookies, do it while the cookies are still warm and out of the oven. You can also make these cookies by rolling the dough into small balls and flattening them out with a fork - we call these butter buttons. In a 10" skillet, melt butter over medium heat. Stir in sugar and dates. Remove from heat and then stir in the egg. Return to heat and continue cooking, stirring occasionally until mixture comes to a full boil. Remove from heat and then stir in the cereal, 1 cup coconut, cherries, and vanilla - until moist. Let stand about 10 min - until it's cool enough to handle. 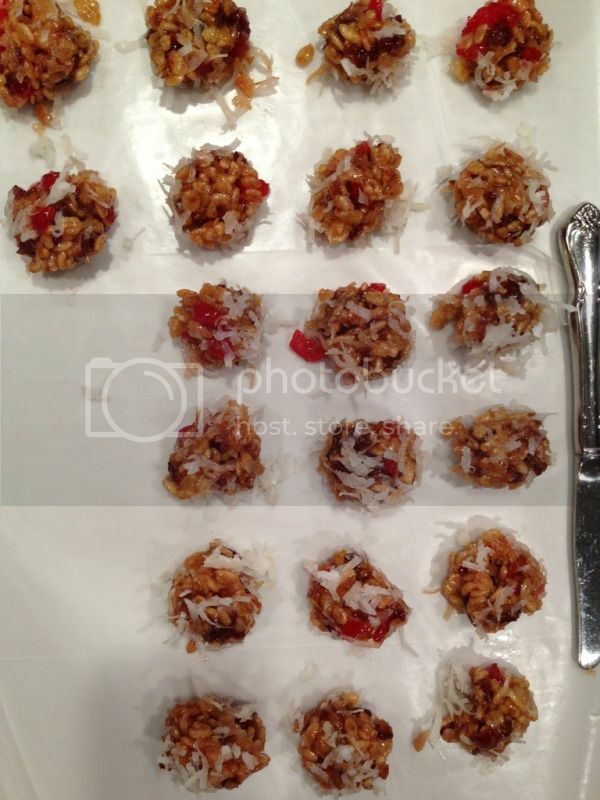 Take about a tsp of the mixture, roll into a ball, and then roll in the remaining coconut. Optionally, put the fridge (I think they taste best cold). Well, that's it for me this year. I hope you and your family have a wonderful holiday together. Do the Butter Spritz Cookies have a strong almond flavor? Or is it just a "hint"? I want to make these but the husband HATES anything with almond extract.